One of the hardest parts of this annual trek south is the change of weather. I can just imagine you feel quite sorry for us! We left Stony Plain late Friday afternoon with Lethbridge as our first overnight destination. It was a moderately okay trip, with a few exceptions of snow on the road, one of which caused some sliding, and a new handgrip on the steering wheel. It was warm enough to stay in the fifth that night, with the furnace on. The hassle and cost of a hotel room for 7 hours is a great motivator. Our first US stop was Idaho Falls. Because we had gotten the Lethbridge leg of the journey over on Friday, Saturday was a short day. We found our usual Walmart RV site, stocked the cupboards and went out for a great supper. The trailer warmed up during the outing and we were able to spend a comfortable evening. Our initial destination south is always St George Utah. It is a good place to set up camp for a few days, get our US phones activated, complete the grocery shopping at Costco, and adjust to the weather. By this time the temperatures are a balmy summer temp to us, requiring shorts, short sleeves, etc. Although there is a convenient RV park in St George, this time we had researched and found a state park very close. We always prefer a state park over a RV park. Although still fully serviced the state park offers you a sense of camping, and typically some opportunity to stroll amongst nature rather than concrete. Sand Hollow was just that. This first stop requires water services as this is the point where we de-winterize the trailer and ensure everything is functioning correctly. Often there is a blip along the way and so there was. It appers that when the trailer was serviced last fall they left the hot water heater on, and hence the element is burned out, as well as another piece not put back correctly, allowing a small leak. The element wil be dealt with when we are in Phoenix, and a trip to find the correct size ratchet solved the other. Simple fixes but frustrating small errors on the part of Olds RV. Although I had indicated my pleasure with the service manager (who has since retired) I do find their service staff have trouble with detail. The first and last time Don will let someone else do the winterizing. Not just the cost but also these ongoing mistakes. Did I mention the battery issue? They had also left the batteries connected, causing a battery purchase prior to our departure! So back to the trip. We also used the time in St George to have the exterior of the truck and trailer detailed. Only about $300 less than in Canada. We spent 2 nights at Sand Hollow, then we were on our way to sand and sun and our annual visit with Ivan. Previous years we met at Stewarts Point on Lake Meade. 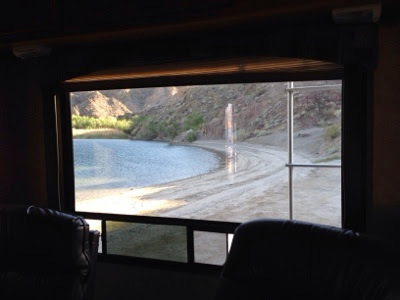 This year we agreed to try somewhere new, and headed to Nevada Telephone Cove near Laughlin. The 7 km drive down a winding washboard road to be able to park along Lake Mohave was more than worth it. Relatively alone in our area, the lack of hiway noise and peacefulness has been exquisite. This morning I count 12 units in total. We are very close to Laughlin, and adjacent to Bullhead City, so we have enjoyed the convenience of being able to run to walmart, etc when necessary. Don has been considering how to fill up our water tanks when we are not near water services. In our previous units this was easily solved with a pail and funnel, but this trailer needs water pressure to fill. Not one RV dealer seemed to have an answer other than "Why would you not fill it up at a tap?" Note to self RV dealers are often not campers, or likely to be what Don calls Pavement Princesses. Anyway, not men to let something win the best of them, Don and Ivan determined a couple of methods to try, and we ended up with success. Full water tanks. I need to now add a disclaimer that although I may be a bit of a Pavement Princess myself, this shortage of water has been caused by a unique design flaw, not my over indulgence in showers, dish washing or toiletry. The overflow hose works a little too well, and the water leaks out rather quickly when driving. Another issue now solved with a stop at the hardware store and the installation of a valve. So this visit has included some work for the guys, as well as allowing some intense discussion of the world in general, and resolution of many topics. And the consumption of reasonably priced beer and wine. Rather a perfect combination. And enjoyed under the blazing Nevada sun. Except for when we were in Bullhead City, then it was the blazing Arizona sun! 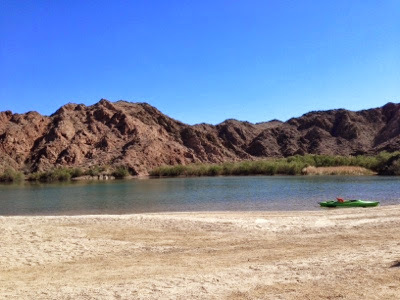 In our down time we visited the Laughlin Riverwalk, and stopped for a bite to eat, as well as those parts trips toWalmart. Don and I also met with a friend from our past, Roxanne. Way back in the day, when we were dating, Don's friend Ron was dating Roxanne. Of course we were friends, but as life changes we moved away, she moved away, etc we lost touch. Facebook is great for this sort of thing, and Roxanne and I reconnected. It turned out we were in the same area, and hence we set up a brunch date yesterday in Bullhead City. It was a great visit, and any worry if Don and her husband Lee would find anything to talk about was not necessary. Of course we recognized each other right away, and there were a few tears on the ladies parts. The conversation, food and coffee passed by far too quickly. Years of catching up - kids, jobs, families, and now traveling and retirement carried us through the last 35 years and brings us to relatively similar spots. Lee is a great guy and the visit just was a tease of what the future may hold. They are a few steps behind us in the retirement part, and we hope that as their path moves forward, we will be able to see them here in the south again. So that concludes this section of this year's adventures of Driving Miss Donna. Don is getting his driving gear on as we move to Phoenix for a few days. Visiting with the Edmunds and some city shopping for this girl are on the agenda. I posted some photos below and will download the camera when settled next stop. I love reading your Blog! !